U.S. – China trade updates were inconsistent. Stocks fluctuated widely on Friday, in large part because of contradictory updates on a potential trade deal between the U.S. and China. President Trump said the two countries are a lot closer to an agreement. Larry Kudlow, Trump’s economic advisor, shared a different perspective, indicating the U.S. is not working out a trade deal with China. These conflicting reports contributed to volatility in the markets as investors tried to determine exactly where we stand. So far, the 3rd quarter earnings season has been a strong one. Of the 74% of S&P 500 companies that have released their data, 78% have beaten their earnings-per-share estimates, and earnings have grown 24.9% year-over-year. However, concerns for at least one major tech company’s projections affected investor behavior. In addition, analysts predict that in 2019, earnings growth will not match the double-digit results we’ve experienced this year. If you felt at all whipsawed by last week’s price fluctuations, especially after October’s declines, you weren’t alone. Even if you know that market volatility is normal, it can feel intense in the moment. Right now, many investors are also jumping in and out of popular, crowded stocks, causing market levels to shift more quickly than many people are used to. To navigate these accelerated changes, you need to remove emotion from investing decisions and stick to your long-term vision even more. 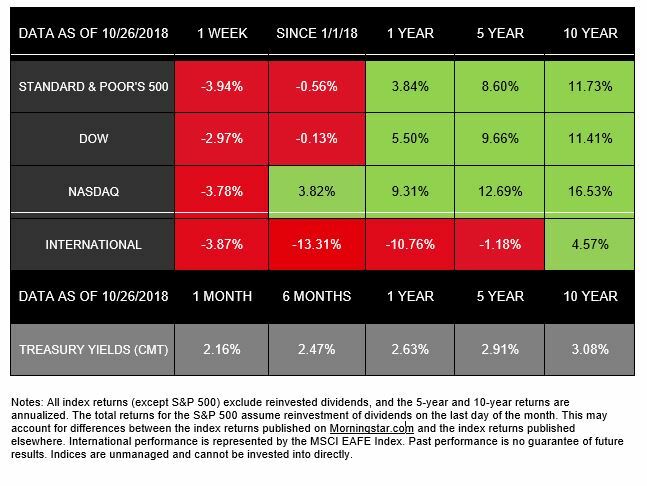 Last week did nothing to dispel October’s reputation as a tough month for the markets. The S&P 500 lost 3.94%, the Dow declined 2.97%, and the NASDAQ dropped 3.78% during what was one of 2018’s most volatile weeks so far. 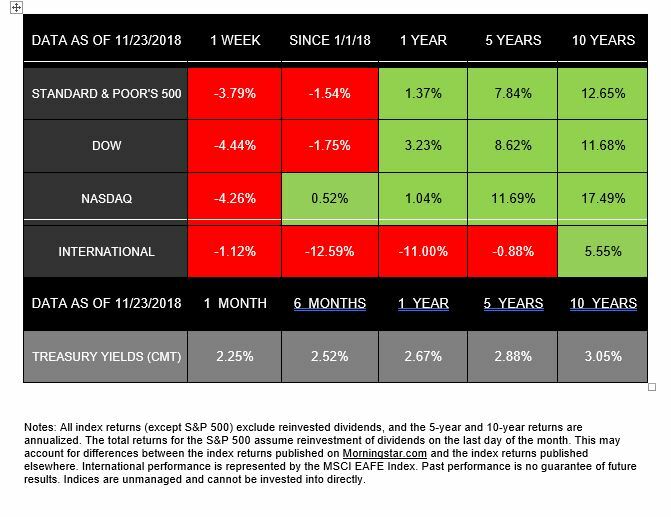 All three indexes are down significantly for the month, and both the S&P 500 and Dow have entered negative territory for 2018. International stocks in the MSCI EAFE also struggled, posting a 3.87% drop for the week, and a 13.31% decline for the year. 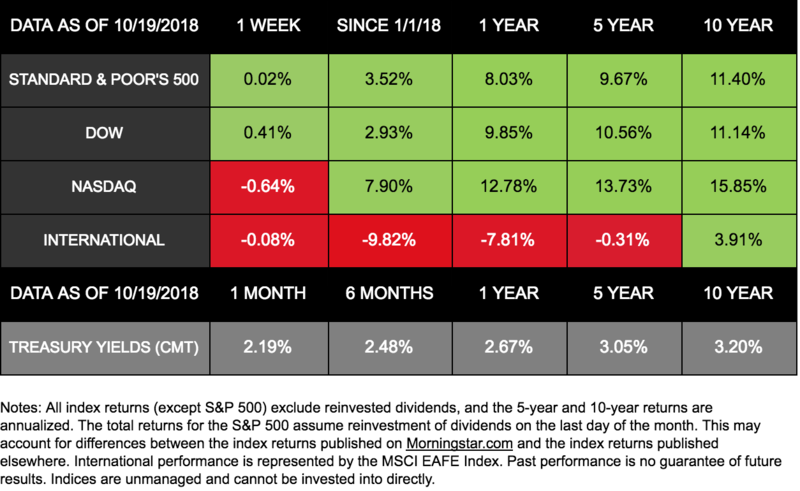 Currently, many topics are on investors’ minds, from inflation to tariffs to valuations and beyond, but analysts are not pointing to one single culprit for last week’s performance. Instead, a mixture of concerns, with a large dose of emotion, seemed to drive the markets. Corporate earnings have been strong, but imperfect: So far, this corporate earnings season is showing 22% growth, but fewer S&P 500 companies are exceeding analysts’ predictions than in the 1st quarter of 2018. In particular, some major tech companies’ results disappointed investors. Examined together, this data indicates that while the economy has potential challenges, it also demonstrates solid growth, reasonable inflation, and strong corporate performance. That story feels different than the sharp drop we experienced last week. However, when you look at the bigger picture, our current circumstances provide another reminder that volatility is normal, and examining economic fundamentals is critical. 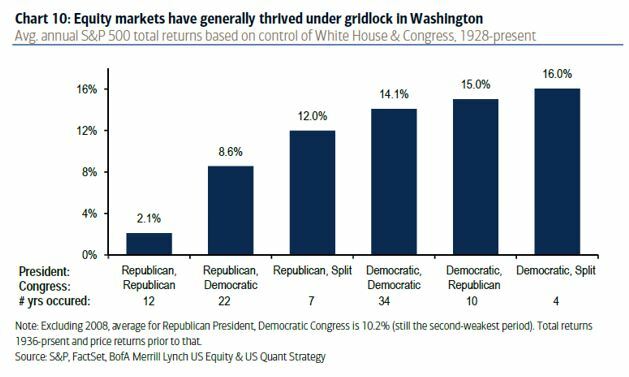 Still, risks exist, and in the coming weeks we will pay very close attention to data and performance. In particular, we will follow the Federal Reserve’s comments and actions to see what may lie ahead for interest rates. In the meantime, please let us help answer your questions and address your concerns. We are here to help you pursue your goals, in every market environment. Historical performance can’t predict future results. However, we do believe that understanding what makes October unique can help provide context for the current environment. 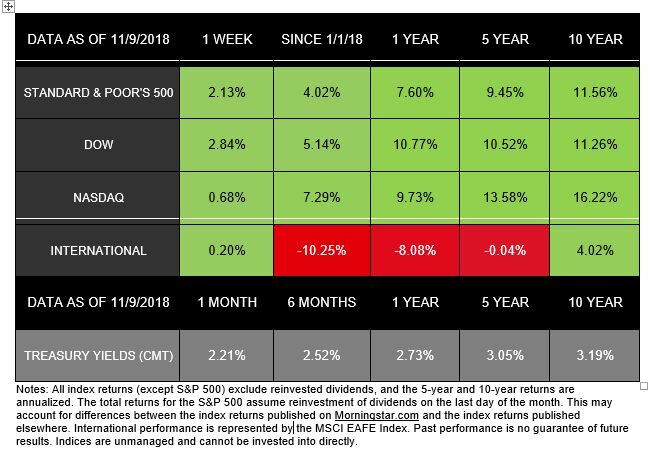 Since 1950, the S&P 500 has experienced more 1% moves in October than any other month. The month has also been the Dow’s most volatile since its beginning in 1896. Exactly how this month will end remains to be seen, as we still have a few trading days left. 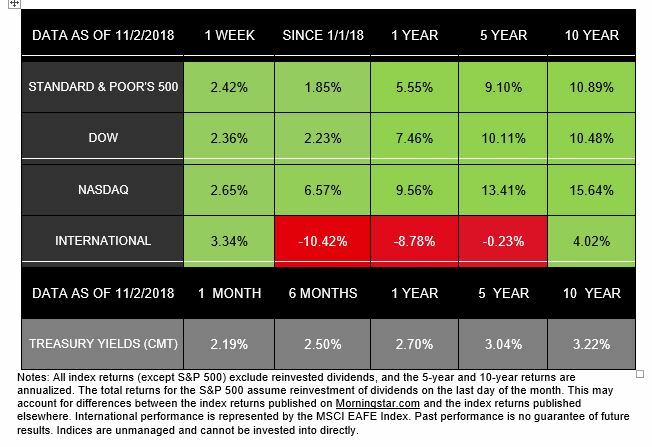 But we hope that understanding how much markets often move in October will help you ride out any future volatility with more confidence. Of course, we’re also here to provide any answers or information you need, so contact us any time.